Sarangkot site at 1425 m.
Views of Mts. Annapurna and Machapuchare. Views of Mt. Manaslu, Himchuli and Lamjung Himal. Our TT4FT tour guide will take you to the paragliding station in Sarangkot by private car. 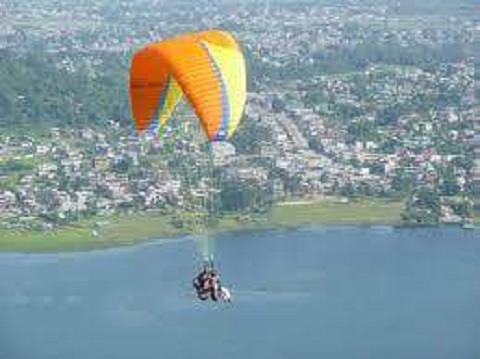 The lakeside of Pokhara in Nepal offers one of the most fantastic places in the world for paragliding. Sarangkot, at 1425 m, is an ideal jump off spot for paraglinding. During the flight, you will enjoy the panoramic mountain views of Mt. Annapurna, Mt. Machapuchare (also known as the Fishtail mountain) which is the 4th most beautiful mountain in the world, and Mt. Manaslu, Himchuli, Lamjung Himal. The Fewa lake area below offers a safe landing place, with many landing spots to choose from. 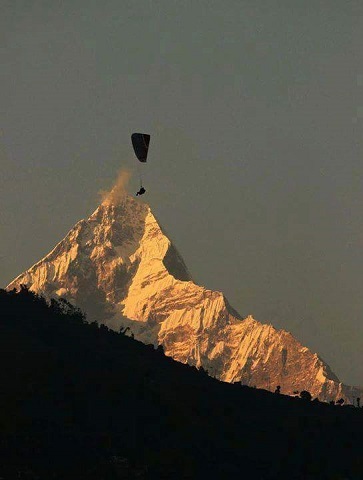 You need to spend at least one day in Pokhara to fully enjoy this paragliding experience. - Private transportation from Pokhara to Sarangkot.